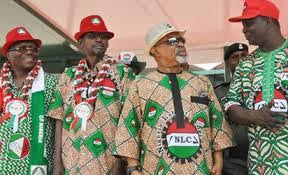 The Federal government, leaders of the Nigeria Labor Congress NLC ‎and Trade Union allies will be meeting today May 16th to discuss on the planned strike action by the Labor congress. The labor leaders on Saturday May 14th gave FG till midnight of Tuesday May 17th to revert to the old pup price of petrol of N86.50 or face a total strike that may begin on Wednesday May 18th. The Federal government and Labor leaders’ meeting will hold at the office of the Secretary to the Government of the Federation in Abuja by 10am..
Those expected at the meeting include Minister of Labor Chris Ngige, leaders of NLC, TUC, Nigeria Union of Petroleum and Natural Gas Workers, NUPENG, and their Petroleum and Natural Gas Senior Staff Association of Nigeria, PENGASSAN counterpart.